Unless you are one of the under-informed (low information voter), you have probably heard the story of the young man from West Virginia who got suspended from school for wearing a pro Second Amendment t-shirt. The 14 year old was told to remove the shirt and when he refused he was arrested. 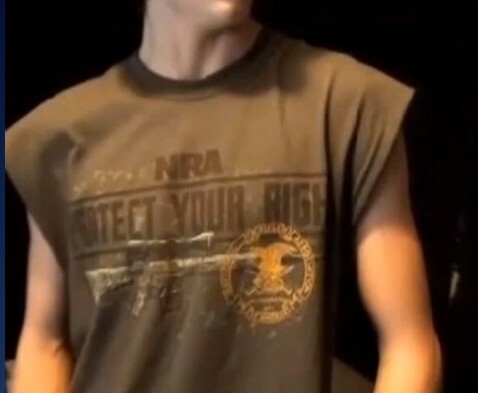 According to his attorney (yes there are some good ones out there) the school code does not prohibit such shirts (his had a picture of a hunting rifle). Let’s stop there for a second. An eighth grader was told to remove his shirt by his teacher who had no right to make him do such a thing. His rights were violated! This eighth grader was then arrested by the local police department. Remember that here we have an eighth grader who had a picture of a hunting rifle on his shirt IN WEST VIRGINIA and he agets in trouble. The police should charge the school teacher for violating the student’s civil rights to free speech. The teacher, after serving her unpaid suspension, should have to attend sensitivity training at Liberty University. The teacher should receive counseling for trying to have a young man remove his shirt thus making him naked from the waist up. The police officer should be “on call” to report to the next “Occupy Wall Street” protest so that he can experience real criminal behavior at a protest. That may take a while as the OWS folks seem to have disappeared. Maybe they ran out of their parents’ money. The police should drop the charges! The young man’s family should sue the teacher, the school administrators, the school district, the police officer, the police department, and the district attorney for violating his civil rights. Suing is a favorite tool of the left so we should embrace it too. The community, which does seem to support the young man, should DEMAND action be taken to ensure that this soviet-style, jack-booted action by “authorities” does not happen again. Everyone should read Framingthedialogue! Tell your friends just not the IRS. People need to get involved with their schools so that taxpayers have a say in what goes on in their schools – after all we are paying for them. This article was published on Jun 20, 2013 . It is tagged adults in charge, arrested, daily caller, first amendment, hunting rifle, student, west virginia. You can follow any responses to this article through the comment RSS feed.